I hope you have been enjoying your week. I'm up to my ears in a big mess of packing over here. Good news is, we drove by our new house (our new favorite thing to do) and they are fixing it up super cute. I can't wait to move and get settled and relax. Our new front yard has a bird bath. I am looking forward to making pine cone bird feeders to hang from the trees. 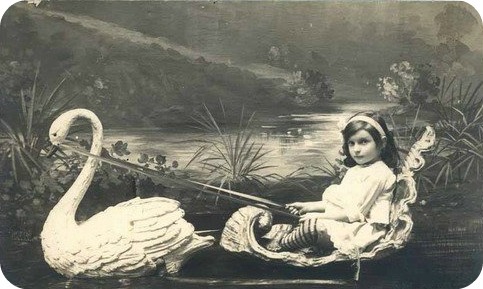 I love this photo this precious little girl and her whimsical swan carriage. Lately I wish I had a swan to shuttle me around. I like to think of this photo when I get overwhelmed lately. p.s. These are on my wish list because they remind me of high school and I need them. i love the tights she is wearing. such a darling picture.